Knowledge is power, and in many cases, that translates into more money. When you know exactly what is going into your business and what you get out of it, you can enjoy the security of knowing where you are financially and where you need to go. Microsoft Dynamics NAV can also help you manage your cash flow better, giving you a clear picture of your finances, deposits, debits, receivables and reconciliations. A good ERP system should help you maximize the return on your investments. A bad one could be a costly and a damaging investment by itself. 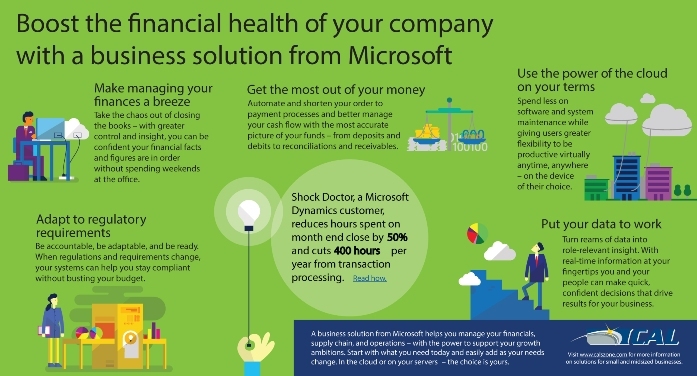 This infographic by CAL explains how Microsoft Dynamics ERP can help you achieve great financial health. To find out how a Microsoft Dynamics NAV ERP system could help save your business time and money, call Compusoft Australia on 02 9597 4377 or fill in a Contact Form to arrange a free demonstration.